I initially became familiar with Michael Crain’s music via his outstanding global-electronica debut album Gaia’s Dream, which was released a few years back under his other recording name Pangaea Projekt. Recorded alongside Jason Carey, their collaborative debut album Tiamatu, Volume 1 derives its title from Tiamat – an ancient Babylonian personification of the sea. As such, Tiamatu consists of ten beautiful compositions that are based upon aquatic and oceanic themes of which seemingly take the listener on a mythical underwater voyage. The opening piece, “Shores of Galapagos”, effectively conveys an emergence from a dark abyss with its electronic arrangement of shadowy, subterranean sound-textures that are enhanced by sparse touches of cinematic drums. A light dash of wordless ethereal vocals accentuates “Beneath the Aegean” – a piece that brings-to-mind a fabled siren beckoning a lone seafarer – while the soft pulse of a heartbeat guides “Heart of Iapetus” along with symphonic elements and shooting star effects. My favorite piece herein is the epically spellbinding and hauntingly emotive, “Flowing Waves”, which employs a sparkling sequence of chords suspended above shifting drones throughout – as it both encompasses and immerses the listener in what feels like an intense wave of emotion. Among the compositions, fluid layers, undulating chords and evolving mists of sound effectively evoke nocturnal imagery of hidden treasure caves, ghostly marine apparitions and lighthouses in the foggy distance. Already joining this year’s favorites, Tiamutu, Volume 1 pleasantly reminded me at times of both Vangelis’ and David Arkenstone’s more aquatic ambient excursions. 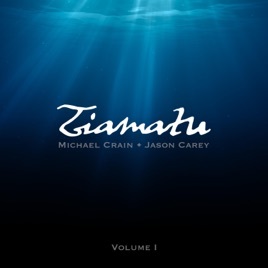 A brilliantly gorgeous album of oceanic space music, I already look forward to the release of a “volume 2” from the outstanding musical talents of Michael Crain and Jason Carey!